I just returned from the South By South West Interactive festival in Austin, where I was reminded of one of my earliest research projects. 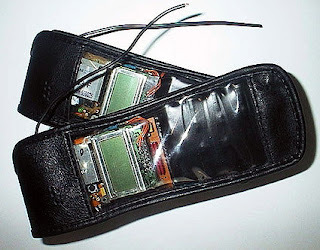 The Hummingbird (above), presented in 1998 and developed together with Jennica Falk and Joakim Wigström, was an "Inter-Personal Awareness Device" (or IPAD for short, no relation to Apple's product!) Originally, the idea was to connect you with people who had a similar interest, so that you could for instance get a notification if somebody who liked the same movies or music was nearby. However, we realized that we could not build many devices (we only did 4 of the first version) so we changed tactics, which turned out to be a good thing. Instead of introducing you to strangers, the Hummingbird would tell you when your friends or colleagues were nearby. It worked by having a radio transceiver constantly send out a unique identity, and listening for other Hummingbirds at the same time. If another user was detected, their identity would turn up on the display, and the device would emit a low humming sound. The idea was to give you a kind of "super-sense" - a background awareness if people were in the vicinity, even if they were in another room or another floor of a building entirely. We used it in a number of settings, including a rock festival, a work group and a big conference. It turned out that this "one-bit" piece of information - merely knowing if someone was nearby - could be both useful and comforting. There had been other location services before it, most notably the Active Badge developed by Cambridge University and others. However, the Hummingbird was different in that it gave you a constant sense of which other people were nearby, and it also worked without any kind of infrastructure, which meant that it could be used outside of an office or campus environment. You can read more about it in our paper Supporting Group Collaboration with Inter-Personal Awareness Devices. Also, Alexandra Weilenman did an interesting study of ski instructors using the Hummingbird, documented in her paper Negotiating Use: Making Sense of Mobile Technology. Fast-forward to 15 years later, and at SXSWi, the issue of "ambient location" or "ambient awareness" was everywhere! A large number of apps were presented that were supposed to give you an indication of when interesting people were nearby, including Highlight, Glancee, Sonar and many more. Unlike check-in based apps such as Foursquare, these services run in the background of your phone and constantly look for other users nearby. However, rather than keep you in touch with your friends, the idea with most of them was to introduce you to new people - just as we originally intended with the Hummingbird, but later abandoned. The difference of course being that while we had to build hardware from scratch, these apps were merely a download away for standard smartphones. So did it work? Apparently not, according to a number of reports afterwards! These apps all drew a lot of battery (a problem we encountered with the original Hummingbird), and seemed to provide very little added value. In particular, it seemed to me when I used them, that they were not good at giving motivation for actually getting in touch with anyone who popped up. "User X is within 500 meters of you and also likes music and books" is not really enough of a conversation starter, especially in a crowded party with hundreds of people around! The closest I got to communicating with somebody was some random messages that were sent to me by people I did not have much in common with - and by the time I saw the messages, I had no way of knowing if they were still nearby. Very soon, I prioritized keeping up with people I already knew through Whatsapp, SMS and Facebook, and uninstalled all the background apps to keep my battery alive a little longer. There have been a number of suggestions on how to make these services more appealing, such as having a useful "single-player mode", but ultimately, I think these startups need to take a step back and re-consider what kind of value they are really providing. Introducing people to each other can be fun, but it is also very easy to step over the line and become creepy. More importantly, to just match people by what they "Like" on Facebook is a very crude approach, and we would need something a lot more sophisticated before I would approach a complete stranger based on an app's suggestions. As seen in our research with the music-sharing service Push!Music (which I will post about another time) it is not easy to make the "jump" from online communication to the real world. But I am sure the underlying intuition about ambient awareness is sound, and eventually somebody will get it right!